I have photographed weddings for over 15 years and am really passionate about this side of my Photography business. My use of Drones for Photography started off as a Hobby and then has very quickly become established as part of my work and the key to this was passing the CAA PFCO Licence. 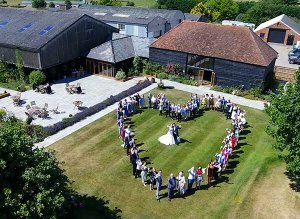 I am a member of many Facebook groups where wedding suppliers are sharing videos and photographs of what they have captured on their clients big days and I am massively concerned to see the use of drone footage dramatically increasing amongst suppliers who are not licenced and also as they are not licenced, they are not insured. I have seen videos posted online of drones flying directly overhead of people at weddings and members of the general public who are not part of the wedding being well within the 50m safe zone getting really close to the dr one (More about this later) Pu simply this is dangerous and has he potential to ruin a wedding day or far worse. 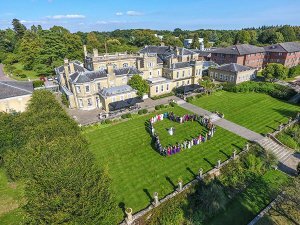 Yesterday I visited a stunning wedding venue which was actually fairly close to a High Risk zone of Bournemouth Airport and I was really surprised to hear that they have many photographers that come along with drones when photographing weddings. I wanted to capture some images of the venue so I put the drone in the air but due to the proximity to the airport before the flight I called the Bournemouth Airport Tower to notify them of the flight and of my Max AGL (Above Ground Level) which was just 40m (The legal limit is 120m). They could not have been more helpful, friendly and appreciative that I called. I asked if anyone else flying a drone at the venue had called them before and the answer was no… I was shocked..
Just to recap what the laws are. If you are flying a drone for fun then you must adhere to the drone code which is principally that you must not take off closer than 30m or fly closer than 50m from people, buildings or vehicles that are not under your control and of course you must not fly higher than 120m or outside of your line of sight. If you are using the drone for any commercial purpose i.e. getting paid for the job or the drone work is enhancing your business then you must hold to PFCO Licence to be operating legally and if you hold the PFCO Licence then you will be well aware of the need to speak to the tower in this situation given above. Previous: Previous post: New Drone Added to the Fleet!